Notice the white walls...they totally work here. 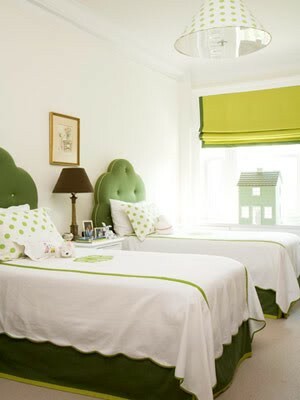 The green hues of this room totally pop and become quite a design statement against the clean backdrop. This room would be stunning for two little girls to share...so crisp and sweet. But what caught my eye is the scalloped coverlet on the beds...it's the same one I'm using on the twin bed in the nursery! It's Matouk's Le Scallop coverlet and I selected mine with pink trim. If I had that money tree in the yard I would have splashed it with a huge monogram, but alas...it is monogram free to save some cash. But I did get the matching neckroll sham and had that puppy monogrammed in bright red! I love the coverlet's sweet simplicity and details and love how it's used in a double dose in this room. I love the look of two twin beds! I am planning that for our daughter's big girl room. She is only 10 months old, so I have time, but I think it is such a fresh look! What letters were in the monogram? Love this room.....it was designed by Amanda Nisbet.